The USB cable kit is designed for PC connecting to alarm console, so that PC window software can operate alarm console working mode and control the AC power switch turn on/off. The FS330W software is designed for Saving/Loading a txt file of the setting program data. It can also READ/WRITE the setting program data from alarm console. It can combine with alarm console, so that it can monitor all alarm events, working mode, temperature lever data, AC power switch turn on number…etc. The USB cable kit and driver can match with all Microsoft systems. PC Setup Window Software can match with all Microsoft systems. User can select to connect to the alarm console via USB cable kit. 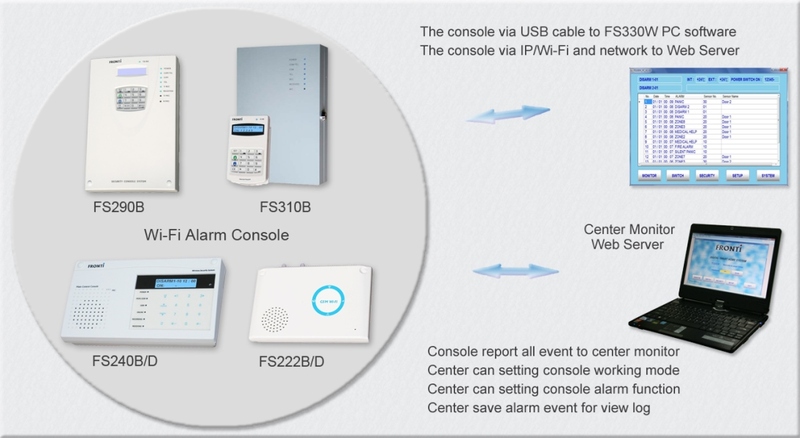 User can also select to connect to the alarm console via IP module on internet. User can operate all working mode and control AC power switch turning on/off. It can load txt file of the program data to copy all program data to another console. It can modify and save to the all program data into a txt file, which is the back-up of the console program data. It can read all setting program data from the console to display window software. It can load txt file or key-in program data and write into the console. It has monitor function for displaying alarm event memory, now working mode, AC power switch turning on number, temperature lever data, door/window open sensors number and more.. It can be installed on touch screen PC, which is for touching operating alarm working mode and AC power switch turning on/off. The window software setup function with explain manual, it’s easier for user to understand how to set all program data. The window software has many language options to save local language SMS.